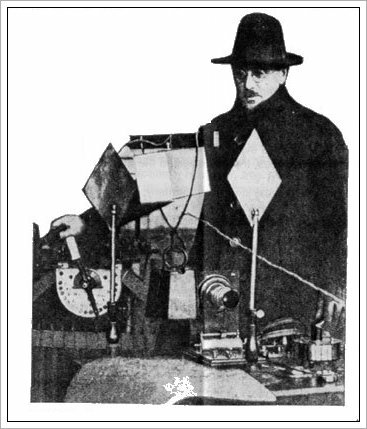 Reprinted from the September, 1927 issue of Science and Invention. Fig 1. The gravitation nullifier is shown in this illustration. The quartz crystal may be seen supporting a 55 pound weight. Dr.Kowsky is shown in a top coat because of the temperature at which the experiments were performed. Although some remarkable achievements have been made with short-wave low power Transmitter, radio experts and amateurs have recently decided that short-wave transmission had reached its ultimate and that no vital improvement would be made in this time. A short time ago, however, two young European experimenters working with ultra short-waves, have made a discovery that promises to be of primary importance to the scientific world. The discovery was made about six weeks ago in a newly established central laboratory of the Nessartsaddin-Werke in Darredein, Poland, by Dr. Kowsky and Engineer Frost. While experimenting with the constants of very short waves, carried on by means of quartz resonators, a piece of quartz which was used, suddenly showed a clearly altered appearance. It was easily seen that in the center of the crystal, especially when a constant temperature not exceeding ten degrees C. (50 degrees Fahrenheit) was maintained, milky cloudiness appeared which gradually developed to complete opacity. 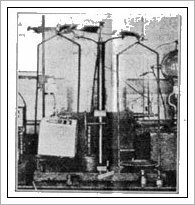 The experiments of Dr.Meissner, of the Telefunken Co., along similar lines, according to which quartz crystals, subjected to high frequency currents clearly showed air currents which led to the construction of a little motor based on this principle. A week of eager experimenting finally led Dr. Kowsky and Engineer Frost to the explanation of the phenomenon, and further experiments showed the unexpected possibilities for technical uses of the discovery. Some statements must precede the explanation. It is known at least in part, that quartz and some other crystals of similar atomic nature, have the property when exposed to potential excitation in a definite direction, of stretching and contracting, and if one uses rapidly changing potentials, the crystals will change the electric waves into mechanical oscillations. This piezo- electric effect, shown in Rochelle salt crystals by which they may be made into sound-producing devices such as loud speakers or reversibly into microphones, also shows the results in this direction. This effect was clearly explained in August, 1925 Radio News and December, 1919 Electrical Experimenter. These oscillations are extremely small, but have nevertheless their technical use in a quartz crystal wave-meter and in maintaining a constant wave length in radio transmitters. This schematic diagram of the experiment is shown in this illustration. The high frequency oscillator has been omitted for clarity. By a special arrangements of the excitation of the crystal in various directions, it may be made to stretch or increase in length and will not return to its original size. Fig 3. This shows how the quartz crystal lost weight when subjected to the high frequency current. The original crystal was balanced on the scale. It seems as if a dispersal of electrons from a molecule resulted, which as it is irreversible, changes the entire structure of the crystal, so that it cannot be restored to its former condition. The stretching out, as we may term this strange property of the crystal, explains the reason for its transparency. At the same time a change takes place in its specific gravity. Testing it on the balance showed that after connecting the crystal to the high tension current, the arm of the balance on which the crystal with the electrical connections tests rode into air. The illustration, of Fig 3. shows this experiment. The transformed crystal was so light that it carried the whole apparatus with itself upwards, along with the weight of twenty-five kilograms (55 lbs) suspended from it and floating freely in the air. Its weight had become practically negative. There can be no doubt that a beginning has been made toward overcoming gravitation. It is to be noted, however, that the law of conservation of energy is absolutely unchanged. The energy employed in treating the crystal, appears as the counter effect of gravitation. Thus the riddle of gravitation is not fully solved as yet, and the progress of experiments will be followed further. It is, however, the first time that experimentation with gravitation, which hitherto has been beyond the pale of all such research, has become possible, and it seems as if there were a way discovered at last to explain the interrelations of gravity with electric and magnetic forces, which connection, long sought for, has never been demonstrated. Fig 4. This illustration shows the relative sizes of the crystal before and after the experiment. It is approximately twenty times its original length on any side.